SAN DIEGO, CA, January 2009 – An eco lodge by starlight – instead of tequila by noon – gives whole new meaning to a secluded spring escape along Mexican waters. Baja AirVentures, that runs Las Animas Wilderness Retreat, the only boat-in lodge on the Sea of Cortez in Baja, Mexico, does promise a complimentary margarita but only after a day of snorkeling, hiking, paddling and impromptu wildlife encounters. For over 20 years the company has strategically avoided the typical spring break crowds by offering a personalized small group experience similar to a Galapagos-style safari that even includes time-saving roundtrip air transport from San Diego, CA. The per person, double occupancy, all-inclusive rate is from $1,495 for four days / three nights and from $1,695 for six days / five nights. 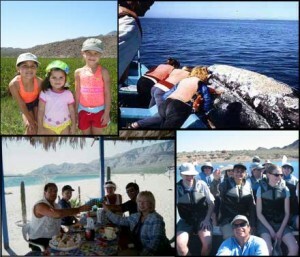 Las Animas is located in Baja’s Midriff Island region, one of the most nutrient-rich marine environments in the world. Guided small boat excursions to isolated islands and coves reveal up to 10 species of whales (including fin and blue whales), as well as dolphins, sea lions, sea turtles and manta rays. Three orders of marine birds – arctic, temperate, and tropical can be spotted here. The islands are inhabited by more than 50 species including Blue Footed Boobies, Brown Pelicans, Royal Terns, Frigate Birds, Cormorants, Turkey Vultures and Osprey. Over 95% of the world’s population of Heermans Gulls and Elegant Terns breed on nearby Rasa Island; a national bird sanctuary, found a short 15 miles journey from Las Animas by boat. Located on a private crescent of white sand, Las Animas is a remote, eco-friendly property that accommodates up to 16 guests in eight romantic beachside yurts. Each features its own private bathroom, solar shower, twin and king-size beds with comforters and high thread-count linens, and covered patios with hammocks. Lodging is built around a large centrally located yurt with attached patio that serves as kitchen, central dining area, cantina bar, and communal lounging and game area. The all-inclusive packages feature yurt accommodations, roundtrip air from San Diego, naturalist guided outings, boat transportation, healthy homemade meals, beverages and such activities as kayaking, snorkeling, swimming, sailing and hiking. Groups and families of four or more may also inquire about a special $200 per person wellness package add-on that includes personalized treatments that range from body work therapies to body scrubs, massages and mud therapy wraps. Daily yoga and meditation are part of the curriculum supervised by wellness professionals. For information on packages offered year-round by Baja AirVentures please go to www.bajaairventures.com or call 1-800-221-9283.